Immersing a vampire from the 1700s into the 1970s seems that it would be a pretty hilarious thing to watch and purely entertaining. 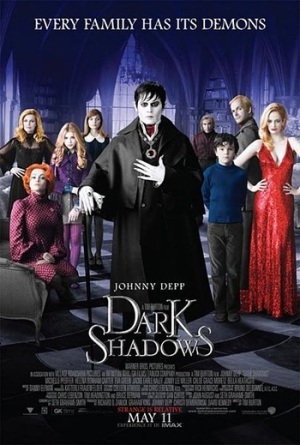 For the new Johnny Depp and Tim Burton film Dark Shadows, it really wasn’t. I must admit, I have not seen the television show that this movie was based off of but the movie did not dazzle me at all. Barnabas Collins (Depp) is cursed into a vampire by an evil woman, who is also a witch (Eva Green) and imprisoned for a hundred years. He is set free and returns to his family home, where he meets his new distant relatives and tries to adjust to life in the 70s. He becomes closer with his new relatives, who later are in need of his protection from the witch. You may be asking yourself, “So, what’s the plot then?” I asked myself the same thing. We spend more than half the movie watching Barnabas Collins being confused by the function of a television, shocked at what people are wearing, concerns about eating a frozen Eggo waffle, and puzzled that the family uses a Chevrolet and not horses for transportation. The plot doesn’t actually surface until the last 15 minutes, which is where the action is. Director Tim Burton tried really hard to make Dark Shadows like his other movies but he didn’t succeed. Depp’s movies are always a treat to watch; even Burton’s movies are treat to watch but the only treat I got from Shadows, was my popcorn and soda. But, Depp is the perfect vampire. He knows how to act oddly and wear a ton of make-up. The visuals, costumes and makeup helped the film a little bit. But writers John August and Seth Grahame-Smith failed at writing any kind of storyline. It provides a few laughs sure, but mostly, side effects include boredom and confusion. Personally, I myself am a bit drained from all the Hollywood vampire obsessions and the Depp/Burton team so that may be part of my negative review but either way, Shadows doesn’t take viewers on any exciting ride. The only characters we spend any real time with are Barnabas and Angelique, the evil witch. The others, like Elizabeth Collins Stoddard (Michelle Pfeiffer) the family matriarch, or the live-in psychiatrist Dr. Julia Hoffman (Helena Bonham Haley) have no real character development. It’s disappointing because the writers and the director had a lot to work with. The film had potential and could have been a splendid time at the movies but it never got there. The film did not have any real direction. I even saw people leave the theatre and they never came back. I guess the direction was towards the exit sign.